What’s it like to be a LEGO Designer? I am vice president of design at the LEGO Group, which means I oversee a team of super talented toy designers. Together we develop some of the most iconic, fun and creative toys in the world! We focus on classic lines like LEGO City and LEGO Minifigures. We also create building sets based on some of the most popular TV shows and movies, like LEGO Star Wars, LEGO Harry Potter, LEGO DC and Marvel Superheroes. I have also been involved in the development of our LEGO movies with Warner Bros.
My childhood dream came true! My brother and I played with LEGO and I used to imagine how awesome it would be to become a toy designer when I grew up. Although I wasn’t sure if it was a real job, so it seemed a pipe dream! I did an art foundation course at college and then studied fashion, textile design and business studies at university. This led me to the New Designers exhibition, where companies meet graduates and see their work. Space is limited, so most graduates displayed one garment or a mood board with their portfolio. I wanted to showcase my entire collection, so I made a miniature version of it all on Barbie dolls. Talent scouts from LEGO saw my display, loved what I did and I was asked for an interview. 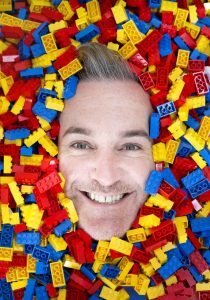 After doing some freelance work, I was offered a permanent role at LEGO HQ in Denmark, so I dropped everything and moved there. There are so many things I love about my job. The creative environment, working with such a diverse group of talented designers, working for such a popular brand that is so dear to so many people’s hearts, but above all making toys that will inspire kids around the world! There is a huge responsibility that comes with my job. As LEGO toys are so loved, it’s important to maintain the standard that is expected from us, while trying new things to make sure our toys are fresh, current, exciting, surprising and relevant for kids of today. For my role, you need a good understanding of design with an eye for detail, topped off with some business sense. But above all, you need heaps of passion to keep the team motivated to come up with the best ideas. Plus, of course, a little element of not wanting to grow up is healthy in the world of toys! There are generally two ways of becoming a designer. One is through a design qualification from university. We have employed people that are product, industrial, transport and graphic designers, plus sculptors and illustrators, as well as those with videogame, entertainment and animation backgrounds. We have also recruited designers from our adult fan community. These super talented guys and girls have spent their lives building LEGO models and improving their building skills to turn their hobby into a career. We receive thousands of applications for designer positions, so people have to make sure their application stands out. What is it like to be a Motorsport Driver? What does a Senior Engineer do? What does a Senior Furniture Designer do?